Fashionably late? Or half dressed? So, I was editing my MSS FALLEN, and I was disgusted with myself. I couldn’t actually believe I’d actually queried the silly thing. It wasn’t ready. And I couldn’t believe I’d been offered contracts on it, but then they must have seen something in it, and were willing to put a little editing into it, to make it truly shine. But that brings me to today’s topic. PATIENCE. As most of my friends and family know, that is something I’m seriously lacking. I want what I want, and I want it NOW! I’m not exactly Veruca Salt, but probably close to it. The only difference between her and me is, I don’t sit back and make other people do things for me. I make it happen. Or I at least try to. But, in writing, patience is not a virtue; it’s a must. Things happen on their own time and not a second sooner. Knowing this, I had written FALLEN, proofed it and then sent it on its way, hoping to get a jump-start on the process. Surely, the powers that be would see its genius. That was, of course, before I knew what a beta reader or critique partner was. Before I joined a writer’s group, and before I’d gotten ANY kind of feedback on it. Sure, I’d given it to my neighbor to read, but to be honest, I don’t think she ever read it. I think she just kept telling me she loved it, because she didn’t want to hurt my feelings. So, of course, I thought it would happen almost instantly, fame, fortune, an awesome agent, not necessarily in that order, but it WOULD happen. And sooner rather than later. After all, Stephanie Meyers did it. It never dawned on me that she was the exception rather than the rule, and that publishing is a whole world onto itself. Most writers are not overnight successes and if they are, they have to have the right book, at the right time. It’s just as much a game of luck as it is one of skill. Sure, FALLEN is great. I’m still in love with it, but the editing mistakes I made, made me shutter when I was going through it “one last time” before sending it to my editor. I realized then, what they meant by write the story, but then shove it in a drawer and come back to it a few months later, when it’s not so fresh in your mind. It really is amazing what you’ll catch. Writing is so much like my time in the military. “Hurry up and wait” became the motto of most of my fellow sailors. From “p-days” to “graduation day,” it’s filled with hurry, hurry, hurry to do this, only to wait for the next four hours while the other 500 recruits who were rushed there ahead of you. In writing, it’s the same thing. Hurry up and write the next best thing, so you can get it out to the agents, before the other 500 writers who are writing in your genre come up with the same thing and then wait 3-4 months for the obligatory rejections. But one MUST take their time when writing. At least to an extent. It’s better to be fashionably late to the party, then to show up half dressed. So take your time folks, use your resources, make your mss and query a must-see. And above all, HAVE FUN!! Writing is more than a job, it’s a passion. Book Review of Jordan Deen’s debut novel, THE CRESCENT. It’s that time again! Book Review Sunday. And this week I have a special treat. For a few days now I’ve been commenting on Facebook and Twitter about a wonderful new author friend of mine who has her debut book coming out in January called, THE CRESCENT. Well, I’ve actually had the privilege of reading an advanced copy of the book and let me tell you, I was blown away. As a lot of you know, paranormal is my thing. 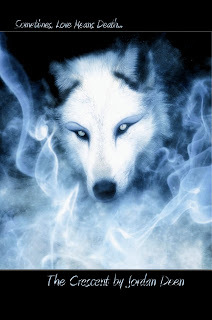 I love a good paranormal fantasy. Vampires, werewolves, banshees, anything that goes bump in the night. So when I heard what her book was about, I read an excerpt and knew I had to read more. And, of course, I asked if I could read an advanced copy so I could review it, since I knew my fans might be interested, too. She agreed and sent me a copy. I quickly finished the chapter I was working on and then dived into hers and I’m glad I did. I was hooked immediately and finished it within four hours. 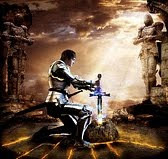 It is a story of war between two clans. Both of which are trying to steer a prophecy in their own direction. Where one girl has to choose between what is in front of her and something she never knew existed. And what she thought was the truth and what isn’t. If she follows her heart, one will die. If she follows her destiny, everything she knows will be destroyed. It starts off innocently enough with the heroine, Lacey, trying to escape from the drama her parents are causing her—they fight all the time–by pacing outside her family home, but she feels like someone is watching her and panics. Only to realize that she jumped the gun and no one was there. Or so she thinks. When two new gorgeous boys show up at her school, she finds herself attracted to the both of them and not quite sure what to do about it. The first, Alex, is constantly by her side and it doesn’t take her long to realize she’s falling in love with him, but when the other, Brandon, shows up and touches her, there is an almost instant feeling of knowing. She wants to get to know him more, but he’s almost never around, except her dreams are filled with visions of him and something else only found in nightmares. I won’t go into anymore, you’ll need to read it for yourself, but I know you can see already this is an interesting take on an old legend and another must read. There were several times I just had to turn the page and keep reading and not once did I want to stop. Apart from a few minor grammatical errors and technical glitches, this book was well-written and well thought out. The tension is a good mix of external, internal, and sexual, and kept me on the edge of my seat the whole time. The characters are well drawn and relatable and the author did a good job of drawing me in and making me feel as if I were Lacey. I can’t wait for the book to come out, so I can make it a part of my collection. I give this book an 8 out of 10 rating and two thumbs up. To read an excerpt, see the book trailer, or order your own copy, please visit her website at www.jordandeen.com. As a few of you may know, this past week has been extremely difficult for me as a writer. The pile of rejections for Mirror Image has been piling up and my dream agent rejected me. Even though he had wonderful things to say about it, it was too romance-y for him, which left me thinking, “But that’s what I do. I write romances.” For the YA market yes, but still romances. So, then I’m like, “Okay, so if it’s too romance-y, where does that leave me.” And I started doubting myself. What if everyone thinks that? Is that why no one is reading past the query? Then with the doubt came writer’s block. The most dreaded of all things a writer faces—besides rejection. No matter what I did, I couldn’t get my mind to focus on character development, dialogue, narrative, anything. Which, of course, made everything worse. Then, I started to even doubt the one book, I’d been sure of, since Hey, it’s been offered 3 contracts from publishers. It can’t be bad, if three different publisher’s wanted it, can it? The answer is, of course not. I had almost 200 readers on the final chapter of Fallen, before I pulled it down. That’s nothing to scoff at, but when you are in the middle of a pity party for yourself, you can’t see reason. But then things started clearing, as they usually do and my husband decided he’d had enough. He convinced me not to give up on writing. It made me too happy usually. And that just because agents couldn’t see how good it was, didn’t mean it wasn’t good. Then I read a blog post the other day about rejection and writing and it talked about how as writers we’re too close to our work. We’re like the overproctive parent that doesn’t let their children do anything. And we have to learn to let go. To realize that not everyone is going to like everything and to look at our work as objectively as possible. Listen to what others are saying. If the majority like your work, then take it as a good sign. That if the majority saw the same thing, then it might be a good idea to change it. So, I started really looking at my work as objectively as possible and realized it was good. Sure, it needs a bit of tweaking here and there, but overall this is exactly something that I would pick up in the store. Then I went back and read the comments I received on WEBook and the other critiquing sites and they all said the same thing. It needs a few things here and there, but overall it’s a good read. So, just because the agents didn’t see it, or at least the ones that have rejected me so far, doesn’t mean it isn’t good. It just means it wasn’t for them. And with over 900 agents out there now, someone is bound to want to represent it. I just have to find them. Hi all. Today’s post is the first ever book review by me. Yay! 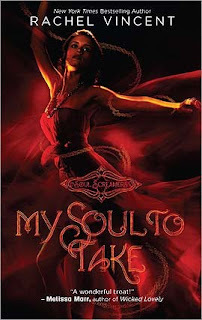 Today’s book is called My Soul to Take by Rachel Vincent. This is a “definite read” rating from me. It’s got everything I love in a book. A little romance, a lot of tension, and a character I can relate to. The first line of the back cover reads. “Something is wrong with Kaylee Cavanaugh…” How can you not read a book with that line? It’s about a girl who’s mother died when she was a baby and whose father abandoned her to live with her Aunt and Uncle, who while they aren’t exactly picturesque of Harry Potter, they are somewhat similar. It starts off with the heronine, Kaylee, sneaking into a local bar. She runs into one of the popular boys from school, who—for reasons she can’t understand—actually wants to hang out with her, but things quickly go wrong. She sees a girl and, for some reason, sees a shadow over her and has to fight this uncontrollable urge to scream her lungs out. Then there’s the boy, Nash, who seems to not only realize why she needs to scream, but is able to calm her down, by mumbling to her. Then it just keeps getting stranger, the girl is found dead—for no apparent reason—in the girls’ bathroom, and then shortly after, other girls from her school start dying, as well. I won’t give away anymore, but this was an awesome read. I couldn’t put it down. It’s most definitely not anything close to anything you’ve ever read and best of all, it’s a paranormal that has nothing to do with werewolves or vampires. This is a must have for any teenager, or teenager-at-heart, on your Christmas list. What’s the big deal with patience anyway? Today’s topic is patience and stress relief, because as my good friends know, that is something I’m struggling with, especially in the last week. Everyone always says “all good things come in time,” and it’s true. Patience is key, but what do you do when you don’t have any? I’m usually pretty good about at least burying my impatience, but this past week has been the hardest I’ve ever had to work to prevent myself from doing something stupid. What am I stressing about and being impatient about? Well, my dream agent contacted me a week ago and wanted the full of my manuscript. I’m not going to say whom because I don’t want to curse it (yes I’m superstitious). I will say, however, that he’s from New York, he’s “young,” and he appears to have my sense of humor. So, for the first time since I started querying, I’m in full panic mode. My thoughts are running the gambit from what if he doesn’t like it, to what if he does? I’m driving my husband crazy and the butterflies have taken permanent residence in my stomach. Along with the flying frogs. I think they’re building a city in there. Complete with condos and subways. So, I thought this would be the perfect time to talk about what I do to try and relieve some of the stress and the first thing that comes to mind is patience. Lots and lots of patience. Of course, that’s the one thing I’m usually short of. Agents are busy people. They work long hours and then come home and work even longer. To be honest, besides the doctor I used to work for, I’m pretty sure agents are the busiest people I know. Their first priority is their clients, so most of the manuscript and query reads are done on their own time. Which is why it is of the upmost importance to research your agents before you query them. I can’t stress this enough. Make sure that the agent you’re sending to is even, 1) Someone you think you can work with, 2) someone who represents—or wants to represent—what you’re writing, 3) is even taking unsolicited queries. Most of this stuff can be found on their webpage. So do yourself—and them—a favor and research before you send. That being said, I know that he’ll read my manuscript in a timely manner and that he hasn’t forgotten me. I also know that my bugging him isn’t going to make him want to sign me. Which is obviously something I want. I have to let my manuscript speak for itself. Which, since I’ve done the steps I talked about in an earlier blog—edited it to within an inch of its life, sent it to beta readers, and edited again—I’m confident it’s ready enough for him. So, I have to be patient as I wait for Mr. Dream Agent to read (and love) Mirror. In the meantime, I’ve taken to scouring the Internet for absolutely anything I can find on him. Unfortunately, there isn’t much. Although what I have stumbled across has been pure gold. Interviews! There is nothing (in my mind) that tells you more about someone than how they answer interviews. And there has been no exception here. True, I may find out something completely different if he wants to work with me, but as of this moment, I’m convinced we’d be a good team. So now that I’ve run out of reading material about him, I’ve tried writing again. It isn’t working. Not really. So, I go and take a boiling hot bath. That usually calms me down for at least an hour and then I can get at least that hour’s worth of writing done. If that doesn’t work, I go take a walk or a bike ride (isn’t Florida wonderful?) or try burying myself into one of the hundred books I have piled on my dresser, waiting for me to crack open it’s cover. Which reminds me; don’t forget to visit my blog on Sundays where I’ll be doing my own informal book reviews. I’m even working on getting a published YA author as a guest blogger for January. If I’m really lucky, I might be able to persuade her to autograph one of her books for me and I’ll have a give-a-way. More details on that at another date, but you can only participate if you follow me on my blog at BlogSpot. And now back to our regularly scheduled blog! So what do you do when your patience runs out, your mind can’t focus on reading or writing, and you’ve taken your tenth bath that day? I’m still working on that. Maybe someone can help me out here. LOL. Oh and if anyone is wondering why I have a picture of a dentist for today’s post. It’s because to me having waiting is akin to being at the dentist. I hate it!! Speak up: Comments Off on What’s the big deal with patience anyway?